Nathwani, who belongs to the Lohana community, accepted a BJP sash from Union Minister Mansukh Mandaviya during Shakti Kendra meeting of the BJP at Hemu Gadhvi Hall here, formally joining the ruling party. 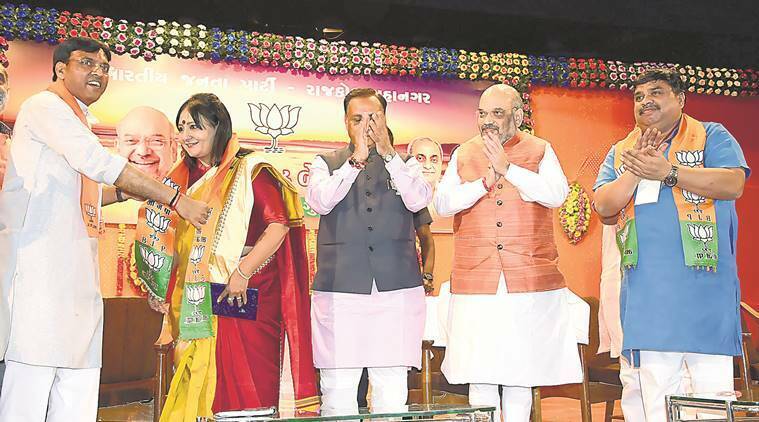 Former general secretary of Gujarat Congress Kashmira Nathwani on Tuesday joined the BJP in the presence of party president Amit Shah and Chief Minister Vijay Rupani at an event here. This is homecoming for the 56-year-old politician, daughter of late BJP leader Chiman Shukla, after 20 years. “My father Chiman Shukla was a founding member of the Jan Sangh and the BJP. I was born in that family. All my three brothers are active in the BJP. After introspection over Congress’s negative ideology of dividing communities and promoting hostilities among them, of harbouring terrorists, and also thinking about the politics of development practised by the BJP and the heights that Narendra Modi and Amit Shah have taken the country to, I consulted my family and decided to rejoin the BJP,” Nathwani told reporters after the event.